Whether it's a couples bridal shower, housewarming get-together or 21st birthday, a stock-the-bar party calls for party-goers to bring their favorite bottle of liquor, wine or beer for the guest of honor. If they feel generous, they can also gift a bar accessory, such as a cocktail shaker or festive wine glass charms. As the host of the party, set out festive hors d'oeuvres, a signature cocktail and, if the occasion dictates, play a few themed party games to keep things fun. Make your choice of media for the invitations -- printed or electronic -- dependent on the formality of the event and your guests' demographic. For a bridal shower, a printed invitation is appropriate, while a housewarming party with a guest list full of millennials might dictate an evite. In either case, make the purpose of the party clear with a line about bringing a bar-based gift. For a cutesy rhyme, print "A bottle of red or a bottle of white, a bottle of tequila for a margarita delight. Glasses or napkins, an ice bucket, too, we'll stock their bar before they say 'I do.'" Tweak the lines as necessary for a housewarming party or other occasion. Adorn the invitation with an image of a cocktail shaker or wine glass; if possible, hole-punch the side and add a wine glass charm for a little something extra. The good thing about a stock-the-bar party is that it doesn't require much decor outside of a clean home. However, you can pull the theme into your decor a little bit by collecting nice liquor bottles, cleaning them and using them as vases for small bouquet of fresh flowers. 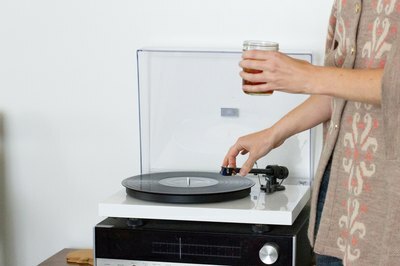 Turn on a playlist of jazz music for background music; avoid songs with words, as they can interfere with conversation. 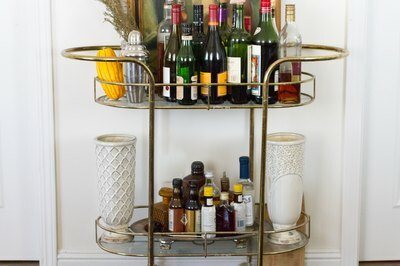 For a stock-the-bar party, plan the menu as if it's a regular cocktail party and go with finger foods and small desserts. Appetizer options include bruschetta or crostini, cheese balls or a cheese platter, crudites, meatballs and sliders. For dessert, set out bite-sized brownies, fruit tarts or miniature cupcakes. Naturally, a stock-the-bar party includes cocktails, so offer beer and wine, as well as one signature drink. For something different, create a gin-and-tonic bar by mixing up the classic cocktail in a beverage dispenser. Set out potential add-ins in bowls and pitchers; options include lime and lemon wedges, grapefruit juice and wedges, bitters, basil and cucumber slices. For some parties, simply mingling is enough of an activity. If you're hosting a shower or birthday party, though, you might want some lighthearted activities. 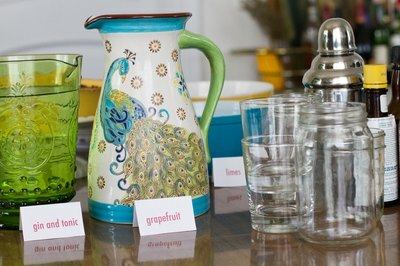 An easy themed activity involves matching the liquor to the cocktail to test your guests' spirit knowledge. 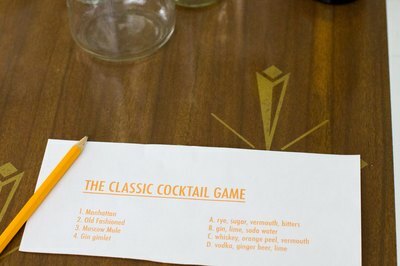 Hand out a piece of paper that lists common spirits on one side and traditional cocktails on the other, and have each draw a line to pair them. For example, vodka goes with a screwdriver, while campari goes with a negroni. You can also host a wine tasting for a smaller crowd by removing labels from a wine bottle and having guests guess which varietal they're enjoying. Always a Blogsmaid: Stock the Bar Shower! Fig + Cotton: Stock the Bar Party!